Thanks to Arron Leslie for filming my reading from the weekend! Just back from an exciting weekend where I got to pretend to be a rock star for a couple of days, on tour with The Wedding Present! Okay, well not quite on tour with them – my husband and I travelled on our own and camped instead of throwing TVs out of hotel windows, but it was as close to being on tour as I will ever get! After Brighton it was onto Holmfirth (where I now know is where they filmed Last Of The Summer Wine) for At The Edge Of The Peaks. The venue here was an amazing building, an old cinema called The Picturedrome. Very cool! I read The Wedding Present section from Trackman which I thought was appropriate, helped out by my husband who read as The Wedding Present fan to my Trackman. We had a great time performing and tried not to look too starstruck as we ventured backstage and met David Gedge and members of the band Cud. We saw some great music too, not only Cinerama, The Wedding Present and Cud but also Nightmare Air, Martin Rossiter (of Gene fame), The Evil Son and David Ford. The official photographer, Auwyn, took some cool photos which can be seen at her website. I was tired out after two days ‘on the road’ but had a brilliant time. A big thanks to David Gedge and The Wedding Present for letting us be part of it all, I even managed to sell a few copies of Trackman! Posted on 28th August 2012 6th July 2015 Categories UncategorizedLeave a comment on Trackman on Tour! 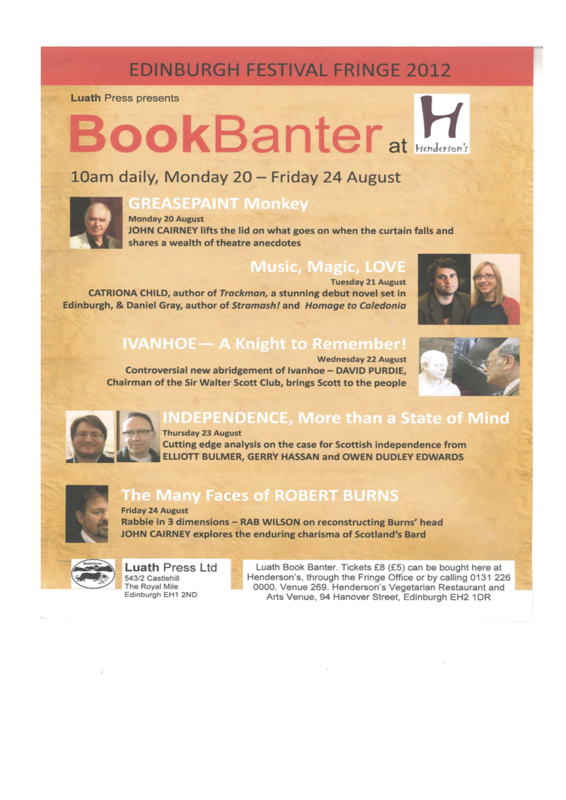 I’ll be reading from Trackman on Tuesday 21st August as part of Luath Press Book Banter. I’ll be reading alongside Daniel Gray at Henderson’s on Hanover Street starting at 10am. Our event is called Music, Magic, Love – sounds good, eh? Come along and say hi! Also a reminder that I’m reading at two mini festivals curated by David Gedge over the weekend of the 25th and 26th of August. At The Edge Of The Sea and At The Edge Of The Peaks which take place in Brighton and Holmfirth. I’ve been to Edge of the Sea as a normal punter for the last few years, so am really excited to be there as a performer this year! Posted on 19th August 2012 6th July 2015 Categories UncategorizedLeave a comment on Music, Magic, Love.